We have opted for accommodation in Hotel "Latnka" [map] on the basis of 3 (or 4) nights: arrival 1 April 2012, departure on 4 (or 5) April 2012, including breakfast and free internet access. Between the hotel and the Central Building "Rectorat" [map] of Sofia University "St. Kliment Ohridski" (SU) there is a regular connection by a public transport - metropolitan (metro). By metro, the trip takes 4 minutes; the trains come every 4 to 10 minutes. The distance is two metro-stops, and it is less than 5 km. The name of the metro-stop for the hotel is "Joliot Curie" [map]. To reach it from the Central Building "Rectorat" of Sofia University, take the metro in direction "Mladost". The name of the metro-stop for the Workshop is "Sofiyski Universitet Sv. Kliment Ohridski" [map]. 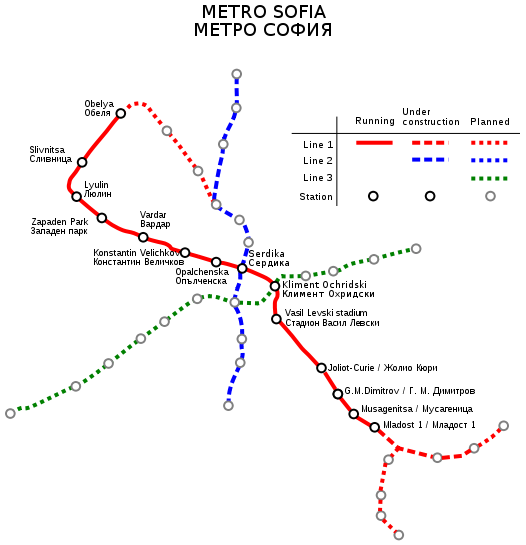 To reach it from Hotel "Latinka", take the metro in direction "Obelya".